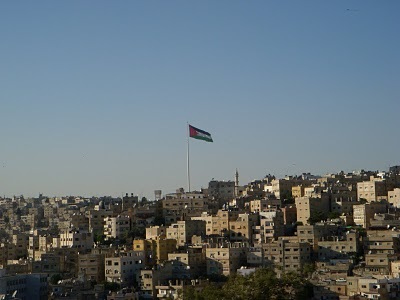 I arrived yesterday in Amman by bus and gradually found the city center. 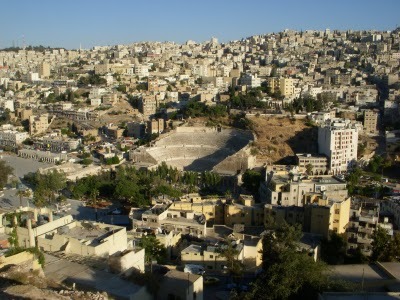 Amman is certainly a city that has a major modern side, along with a conservative, poor side. Although, there is no comparison to Cairo. Amman is very clean without any smog. Couch-surfing really is a special provision. There are parts of Amman that I would have never have seen if I didn’t hook up this couch-surfer here in Amman. The area I am staying in is just behind the university area of Amman. 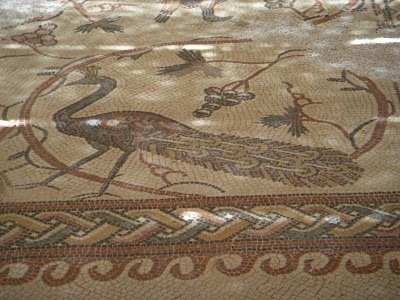 The university is the largest in Jordan which looks like a very nice collage. I am just taking it easy, the flat I am staying is very comfortable, the couch-surfer that owns the flat works at the Arab Bank, we will be hanging out this evening. This friday they are having a couch-surfing gathering of people that are signed on here in Amman. It will only work out for me to stay at this flat until Friday morning, although I might hook up with someone else to stay with through the contacts here in town. I am planning on staying in Amman for a good week. 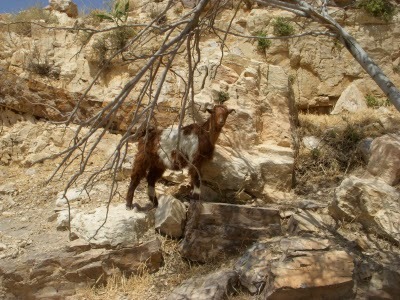 Then I will head north to Irbid. I will be heading to Lebanon by the 20th of May. 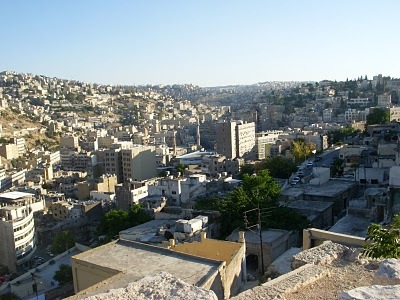 The below picture is of the downtown – city center of Amman. 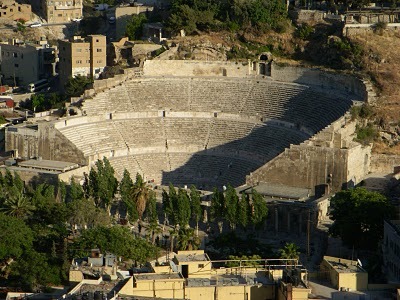 The above picture is of the 6000 seat Roman Theater which is walking distance from the city center. There is a common, across the board, type of culture that many people have expressed their dislike regarding this aspect of cultural. The subject of honor next to shame dominates the family life and the actions of the populace. The concept that people don’t mind their own buisness, and people openly gossip to the insult of others is not positive. Critizism with strong lableing judgments is very common. I always catch people laughing at me just because I am carrying a backpack and from the west. The ego dominates, which this is common behavior all over the world – just different levels in each culture. Nevertheless, when I lived in Hawaii the common rule was that each person was expected to mind their own business. One thing is that minding our own business, although willing to help your neighbor if their in need, prevents problems. This one aspect I did like about California and Hawaii, is that there is much more open self-expression, and that people basically mind their own business and are less judgmental then other states in America. I have talked to many people that would rather have more interaction between the sexes, and in Amman there is, because of being a big city, although still there is that issue of reputation, honor verses shame. Consenquently, the protection of the family honor is still a dominating factor – a good reputation means everything. A women needs to safe-guard her reputation because she could be easily be labeled from the demented mentality of the populace. There are many states in America that this type of demented mentality exists. If you find yourself free from this type of enslavement – be thankful – including being free from a controlling family. Many people are meant to experience this form of slavery. This is the one sole reason people look to money, because they feel that money can give them freedom, which in a sense it does in the Arab world – spiritually the attachment to money causes a road-block. 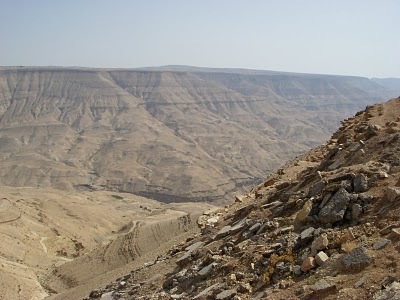 The above picture is of the Grand Wadi Mujib. Next post: Modernization of Amman. Previous post: Heading to Amman.